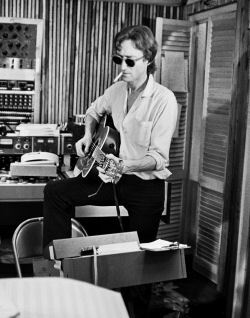 The 27th anniversary of a death might not be the most obvious date to be heralding, but nonetheless Proud Galleries are using this as the raison d’être for their upcoming photographic celebration the life and career of John Lennon. Not that they need an excuse with what promises to be such an interesting show. "Remember Love: John Lenon" features iconic images by Dixie Dean, Terry O’Neill, Barry Plummer, David M. Spindel and Jurgen Vollmer, but perhaps more intriguing will be the exclusive display of photographs by Tom Hanley and Polly Moseley, whose work offers a more intimate and personal portrayal of the legend. Tom Hanley had enviable access to the Beatles throughout the 1960s and his photographs show the young Lennon behind closed doors in Parisian hotels and the Apple offices at the height of Beatle mania. In contrast, Polly Moseley’s pictures are of Lennon later in life when he was with Yoko Ono, showing him at work and relaxing amongst friends. The collection is completed with a series of photographs of John as a boy, donated to Tom Hanley by John’s aunt, Mimi. The exhibition runs from 7th December 2007 to 2nd March 2008 at Proud Central,5 Buckingham Street London WC2N 6BP. Visit the Proud website for further information.